The Romans make the 300 mile round trip to Kent, where they take on Dartford in the Vanarama National League South. Kick off – 3PM at Princes Park! City dropped one place to fourth last weekend after Chelmsford City took full advantage of the postponement at Twerton Park by beating Hungerford Town by four goals to one in Essex. Jerry Gill’s in-form side are currently unbeaten in nine and they’ll be looking to hit the ground running after a two week break when they travel to Dartford on Saturday. The Darts are in somewhat of a transition period after long-serving boss Tony Burman left the Kent club in the summer after a successful 14 years at the helm. Management duo Adam Flanagan and Jamie Coyle, both former Dartford players, have since taken over and have assembled a squad that currently sit seventh in the table. 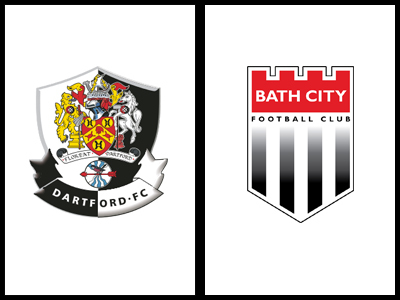 The Romans have struggled against Dartford in recent years, falling to defeat in all of our away fixtures at Princes Park along with picking up just one point at Twerton Park back in 2015. In fact, you have to go back to 1990 for our last victory, when a solitary Gary Smart strike earned City all three points in front of over 1400 at Dartford’s old ground, Watling Street. It’ll be another tough test at the weekend but the Romans go into the match rested and full of confidence! Can Jerry and his players get that elusive win in Kent? Will it be ten unbeaten at 5pm on Saturday? Hit the road with The Romans and get behind the boys as they continue to hunt down the league’s leaders.